Is the beaten-down tech stock ready to rebound after being cut in half this year? Western Digital (NASDAQ:WDC) lost about half its market value this year due to concerns about its declining HDD (hard disk drive) shipments and exposure to peaking NAND (flash memory) prices. Yet the steep sell-off reduced Western Digital's forward price to earnings (PE) ratio to 5 and boosted its forward dividend yield to 5.2%. Should investors consider WD to be an undervalued income stock at these levels, or is it headed lower? What happened to Western Digital? WD is the world's largest manufacturer of traditional platter-based HDDs. Its main rival in that market is Seagate (NASDAQ:STX). Over the past few years, the HDD market was disrupted by the rise of flash-based SSDs (solid-state drives), which were faster, smaller, more power efficient, and less prone to damage than HDDs. To stay ahead of that curve, WD acquired SanDisk, one of the world's leading makers of flash memory chips and SSDs, in 2016. The move was a double-edged sword: It boosted WD's revenue and made it a leader in the SSD market but greatly increased its exposure to the cyclical NAND prices, which peaked earlier this year. Meanwhile, decelerating demand in WD's core data center, client computing, and non-computing markets caused its total HDD shipments to fall 19% year over year (and 13% sequentially) to 34.1 million in its fiscal 2019 first quarter. WD's total exabytes sold fell 3% sequentially, as a 28% jump in flash exabytes sold failed to offset a 6% drop in HDD exabytes sold. WD's non-GAAP gross margin of 38% during the quarter also marked a steep drop from 41% in the fourth quarter and 42.3% a year earlier. The company's HDD gross margin grew from 31% to 32%, but lower NAND prices caused its flash gross margin to drop from 53% to 44%. That's ironic, since lower NAND prices would have become a tailwind if WD still bought its chips from third-party suppliers. Source: WD quarterly reports. EPS = Earnings per share. All percentages represent year-over-year change. Those cyclical pressures won't ease up anytime soon. B2B trading platform DRAMeXchange expects NAND prices to continue falling for the first half of 2019 as the market faces a glut of chips amid slowing sales of smartphones, PCs, and other consumer electronics. Data center spending is also expected to decelerate worldwide, and tariffs could exacerbate the pain. For the full year, analysts expect WD's revenue and earnings to decline 16% and 52%, against fiscal 2018, respectively. Seagate, which isn't as heavily exposed to declining NAND prices, is expected to post a milder 5% drop in sales and a 6% dip in earnings this year. That's why Seagate is only down about 10% for the year. What's Western Digital's battle plan? Western Digital plans to reduce its wafer output by 10% to 15% in calendar 2019, which could shield its gross margin and FCF from further declines. However, the move will also cause WD to incur a GAAP charge of $250 million to $300 million throughout the remaining quarters of fiscal 2019. WD still sees growth opportunities in higher-growth niche markets like high-capacity enterprise drives, surveillance hard drives, and embedded flash solutions -- which each generated more than 30% year-over-year sales growth last quarter. Seagate is also focusing heavily on the enterprise storage market, which prefers cheaper drives with higher capacities to pricier SSDs with lower capacities. WD plans to continue launching new hard drives optimized for cloud computing -- like the 15-terabyte SMR (shingled magnetic recording) -based hard drive and its new SATA (serial advanced technology attachment) -based client SSDs -- as well as embedded flash drives for higher-end smartphones. 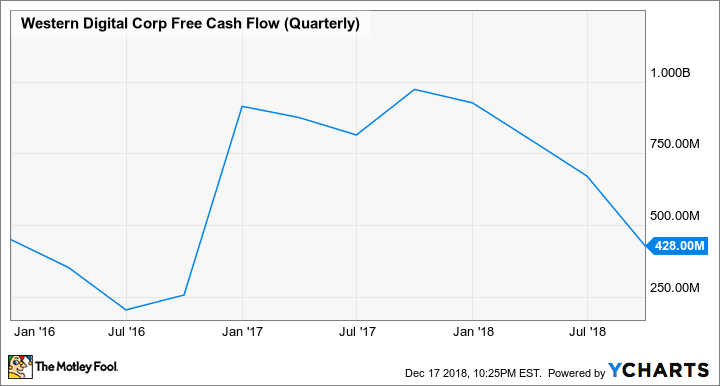 WDC Free Cash Flow (Quarterly) data by YCharts. WD's stock is cheap right now because it's firmly pegged to the cyclical NAND market. The situation might improve once NAND prices bottom out and trade tensions wane, but there simply aren't enough near-term catalysts for this stock yet. Therefore, I'd stick to the sidelines until the company shows more flickers of life.